Remove the peel of two oranges with a vegetable peeler, taking only the orange part. Try to leave the white pith behind as it’s very bitter. 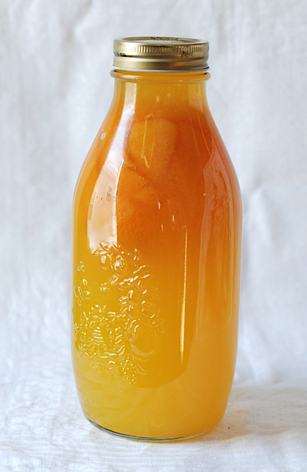 Add the peel to a clean quart jar, then juice all the oranges. You should have about 1 1/4 cups of juice or more. (These oranges were so juicy that I had 1 1/2 cups with only 4 oranges.) Add enough water to make 1 1/2 cups if you’re short. Dissolve the sugar in 1/2 cup of juice in a sauce pan over low heat. Once dissolved, add the remaining orange juice and stir. Bring to a boil then turn down to a simmer for 5 minutes. Cool. Add the cooled syrup to the quart jar with the peel and fill to the top with vodka. Store in a dark, cool spot for at least a month. Strain and bottle. Makes 1 Quart. Use Orange Liqueur in any recipe calling for Triple Sec or check out my Triple Orange Margarita cocktail!